ARLINGTON, Texas — Bartolo Colon’s third attempt at making major league history ended unsuccessfully again when his pitchers’ duel with Carlos Carrasco became one-sided in the fifth inning. Colon (5-8) failed in his third bid to record his 246th career win and break a tie with Dennis Martinez for the most career wins for a major league pitcher born in Latin America. He allowed five runs and eight hits in 4 2/3 innings. The first-pitch temperature of 107 degrees fell one degree short for the second consecutive night of this season’s major league high. When the Los Angeles Angels hosted the Dodgers on July 7, it was 108 degrees at first pitch. Right-hander Mike Clevenger, Cleveland’s scheduled starter for Sunday afternoon’s series finale, said he made a rehab start in Arizona with the temperature at 128 degrees. Clevenger adjusted his diet late last week with more carbohydrates and fruit in anticipation of Sunday’s heat, and will take an IV early in the day. “I think that puts me in a good spot,” he said. Alonzo’s homers and one by Tyler Naquin came off Austin Bibens-Dirkx, who was recalled from Triple-A Round Rock earlier in the day. Bibens-Dirkx pitched four innings and allowed 11 runs in relief, a club record, and 13 hits. He threw 87 pitches, 14 more than Colon. “I’m very excited about what I did,” Choo said. Cleveland 3B Jose Ramirez singled and tripled for his 39th multi-hit game, tying him with Boston’s J.D. Martinez and Atlanta’s Nick Markakis for the major league lead. 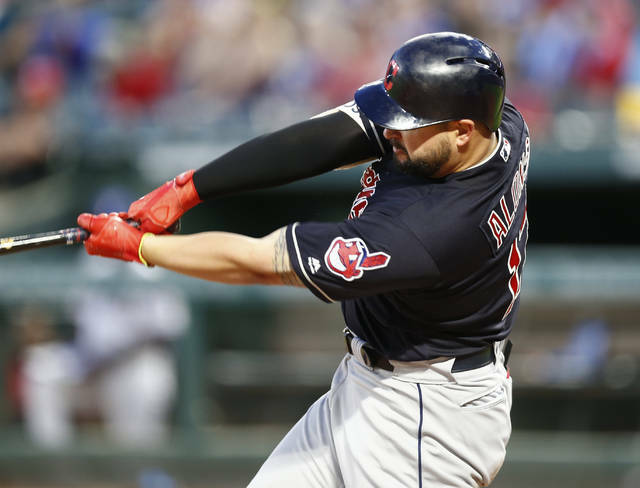 … Indians RF Melky Cabrera had two doubles and a single in his first major league game since June 13. … Cleveland LHP Ryan Merritt, who had a memorable start in the 2016 ALCS, cleared waivers and was assigned to Triple-A Columbus. … Texas optioned RHP Ricardo Rodriguez to Round Rock. Indians: OF Bradley Zimmer (right shoulder), sidelined since mid-June, will miss another 8-12 months following arthroscopic surgery Friday in Dallas. Rangers: LHP Alex Claudio (left-ankle sprain) was activated off the 10-day disabled list. Indians: Clevenger (7-5, 3.47) has the American League’s fifth-best road ERA (2.61), going 4-2. Rangers: RHP Yovani Gallardo (3-1, 8.60) equaled a season high by allowing six earned runs in his previous start, an 8-4 loss at Boston on July 10.